On September 30, the National Hot Mulled Cider Day is celebrated throughout the United States. It is the perfect occasion to enjoy a cup or two of warm spiced cider in cool weather. Hot mulled cider is a delicious beverage that will make crisp September afternoons march warmer. It is a popular fall and winder drink often associated with end of the year holidays such as Halloween, Thanksgiving, and Christmas. 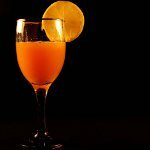 It is made with apple cider (or apple juice for the non-alcoholic variation), sugar, and spices. Hot mulled cider can be easily made at home. In a large saucepan, combine 2 quarts apple cider, 1/2 cup brown sugar, 3 cinnamon sticks, 1 tsp whole cloves, 1 tsp whole allspice, 1/4 tsp salt, and 1 dash nutmeg. Bring to boiling, cover and simmer for 20 minutes. Strain and pour into mugs. Garnish with orange wedges before serving. Sometimes liquor is added while preparing this drink. For example, you can make hot mulled cider with rum. Stud 1 apple with 2 tsp whole cloves. In a medium pot, combine 2 quarts apple cider, the studded apple, 1 thinly sliced orange, 1/2 cup light brown sugar, 1 tsp allspice, 1 dash nutmeg. Bring to boil, simmer for 10 minutes. Strain, add 1 cup dark rum and pour into mugs. Garnish with cinnamon sticks.